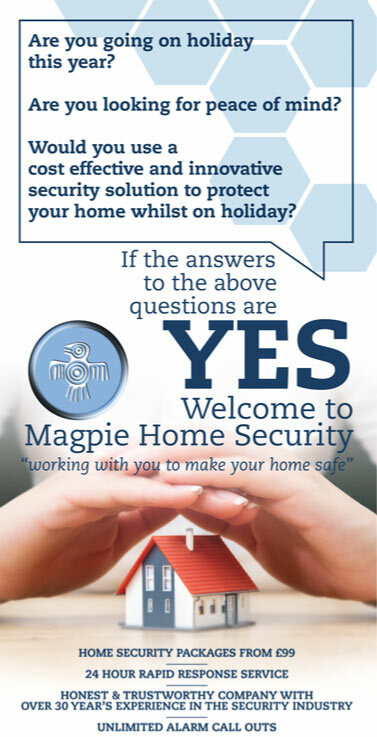 The Magpie Home Security System is an ideal solution to protect your home whilst you are away on holiday. The Home Security System is a wireless solution which requires no installation and will give you the peace of mind guarantee that your worldly belongings are safe and secure. Supported by a company with over 30 years’ experience within the security industry, you can count on our Rapid Response service in the event of any alarm activations. With house burglaries within Nottingham on the rise, home owners and residents now want to ensure the protection of their home more than ever. With a variety of solutions available on the market, it is essential to choose the correct system for your needs and requirements. The Magpie Home Security System is an innovative solution which combines the latest technology with the experience and alarm response times of an accredited security company. How does the Magpie Home Security System work? The system is activated by entering a 4-6 digit code into the keypad which will alarm the Magpie Home Security System. The detection devices are now in constant communication with each other and our monitoring station. If any detections are activated, the PIR cameras will start recording and an alarm will be sent to our 24-hour monitoring station, who will be able to view the security footage. Our Rapid Response Team will be deployed within 10 seconds to attend the alarm activation and check the premises making sure there are no intruders or unwanted visitors, contact any emergency services if required. Our Rapid Response Team will only leave the property is they feel is it fully secure. Full reports of any Alarm activations are emailed to the customer within 24 hours. In the event of any activation, a Security Mobile Response Driver will attend site, check the premises/site making sure there are no intruders or unwanted visitors, contact any emergency services if required. The Security Driver will re-set the alarm ensuring the site is left safe and secure.